Hydrogen gas explosion. Note the battery is burned from the top down. 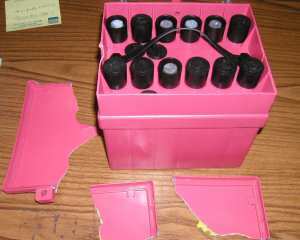 This is a lead acid battery with vent caps - the kind you add water too. During charging explosive hydrogen gas is vented from the caps into the battery box. The box must be vented and have sufficient air circulation to prevent the build-up of hydrogen. Also, rapid charging a discharged or "dead" battery generates large amounts of hydrogen gas. "Jump starting" a dead battery and then allowing the aircraft charging system to charge the "dead battery" can dump the full capacity of the aircraft alternator into the battery causing large amounts of hydrogen gas. One does not "jump start" an aircraft battery and then go fly the airplane for many safety reasons. 1. Non-sealed battery's must be vented and have air circulation. 2. 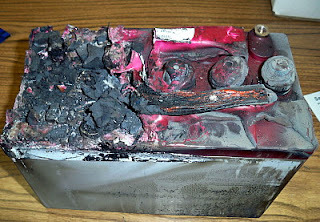 Never use the aircraft charging system to charge a dead aircraft battery. Note: sealed recombinant gas aircraft battery's vent much much less hydrogen gas as most of it is recombined inside the battery. Both Concord Battery and Gill manufacturer Recombinant gas batteries. Concorde will void your warranty if they find the battery was jump started.